We are specialist in commercial vehicle modifications. The product Portfolio includes Special Frames, axle works, cabin modification, an others. We modify standart trucks to special trucks at all kind of ways. Our Special know-how includes frame modifications, axle work, cab modifications. 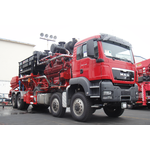 We are able to built total special truck chassis for special purposes.